"Play Texas Hold'em Poker in the wild west"
What would be life without poker? 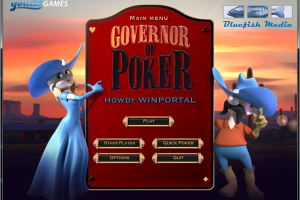 The threat of poker being banned is over Texas, and you must become the governor to avoid it. And you will do it in the best way you could: playing Hold'em Poker. Governor of Poker is an original game that will bring you back to the roots. You won't just play for money, but for transport, real state and tournament titles. Step by step, you will get closer to your last objective and let everyone in Texas keep playing your beloved game. As you are good willing for a whole state, you will be traveling all around it. There are 13 cities where to play. Traveling through them will only be possible earning transports, and you will own transports by winning games. You will be playing tournaments of different sizes. Your opponents have different styles, and sometimes they will be bluffing. You must be smarter than them to get to be the Governor of Poker. Additionally, you will also have the chance of playing just a quick game. Governor of Poker is a lot more than just another Hold'em game.